For you had to take the dirty dishes downstairs, wash them and tote them back up! It was far easier to go downstairs for my first cup of tea. at half past three when it is just me. 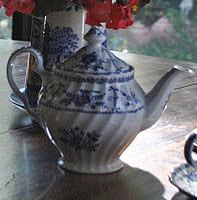 A Christmas gift from Husband Jim because I didn't have a "big" blue teapot! Because it was so much cheaper there. I felt that I need a Blue Italian teapot as well. The teapot that goes with my silver tea service. If she had any other pieces of silver, I don't remember them. Perhaps, it belonged to her mother or grandmother? and is a reminder of my dear grandmother. I would have spent on dinner -- that money went to buy the pot! Used mostly for special teas! It was bought specifically to go with those cups and saucers. And although it's blue it's more of a turquoise blue rather than the blue one thinks of when one thinks of English transfer ware. 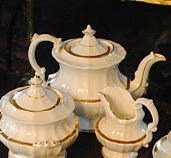 It's part of a "tea set" -- teapot, creamer, sugar, cups, saucers and tea plates. because I wanted an English tea set and it was "sort of" blue and white! For a song because it was "last season's" color! It's my most used teapot. I use it every morning for my morning tea. then decanted into the silver pots. But the real workhorse . . .
except it's 110v while those were 220v. 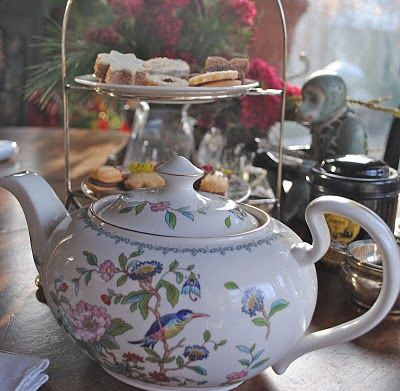 It's Tuesday and I'm sharing my teapots with Sandi at Rose Chintz Cottage for Tea Time Tuesday. Great collection! I love teapots. Besides the electric kettle, the teapots are so decorative as well...and added bonus! Dear Martha, thank you for the lovely tour of your tea pots on this cold, snowy morning. I love them all, but the Blue Italian might be my favorite! I had to stop my tea two months ago for health reasons. It has been so hard! My tea pots are silent reminders, looking lonely. Maybe someday soon I can add a little tea back but for now it is cold turkey on the tea! What a wonderful collection - especially the blue and white ones! I think I love that white one with gold the most - especially the shape! A nice collection of teapots Martha. I'll use one mine for awhile then switch to another when I need a change. What an amazing and unique collection of Tea Pots, dear friend!!! 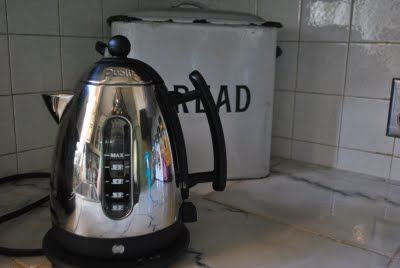 While all are lovely, I was quite smitten with the silver tea pot with the onion shape!!! Thank you for sharing your refined collection with us! Great collection, even if you didn't set out to collect them.